Home › Electronics › Mounting Dream Md2163-K Low Profile Height Adjustable Tv Wall Mount Bracket F.. Mounting Dream Md2163-K Low Profile Height Adjustable Tv Wall Mount Bracket F.. Fits for most of 42-70" LCD/LED/Plasma TVs up to weight of 132 lbs and up to VESA(mounting hole pattern) 600x400mm (Fits for VESA 200X100, 200X150, 200X200, 300X200, 300X300, 400X200, 400X300, 400X400, 500X300, 600X200, 600X400mm). 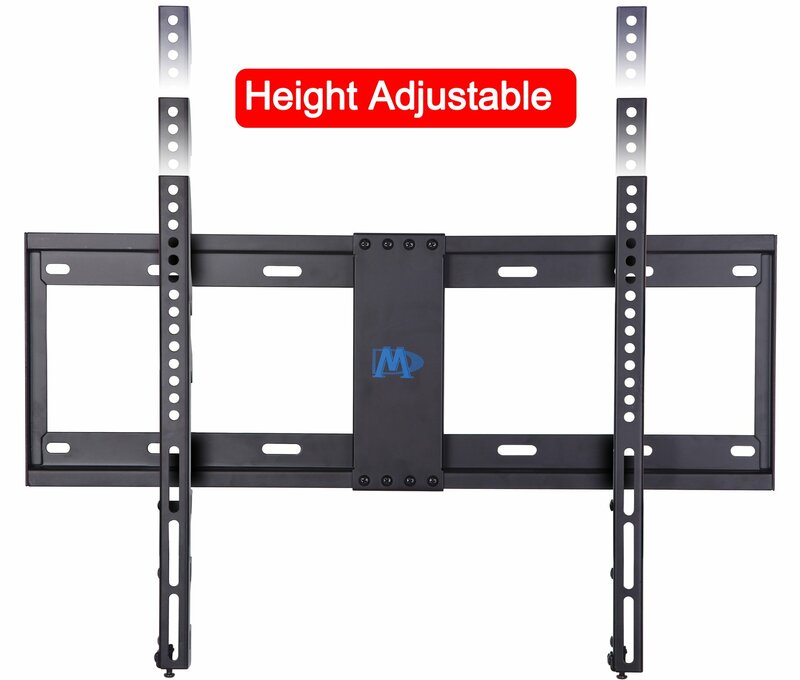 Please check VESA (mounting hole patern), stud spacing, possible blocked cable/input and TV weight prior to making purchase decision to determine whether this TV wall mount fits your TV and the installation application. 1" low profile Ultra slim wall mount design, fits 16", 24" studs.This mount fits solid concrete wall/wood stud installation. Caution:This mount is NOT for dry wall alone installatoin! Heavy duty steel construction provides 132 lbs loading capacity. 3 height level adjustment hooks design for easy TV hanging height setting. All hardware, Magnetic bubble level included. Fits 42-70" TVs This mount fits essentially all 42-70" TVs sold today. It fitsTVs with mounting holes as close as 8"x4" or as wide as 24"x16" (in TV terms -VESA 200x100mm to 600x400mm). Low 1" profile 1" low profile Ultra slim wallmount design. Heavy duty steel construction This mount is constructed withheavy duty steel materials and with durable powder coated finish, high gradecold rolled steel makes this mount sturdy and strong. Supports TV weight up to132 lbs. Fits 16" or 24" studs plus concrete wall This mount fits for 16" or24" studs plus concrete wall typical in US homes. All installation hardwareincluded.This mount fits solid concrete wall/wood stud installation.Caution:This mount is NOT for dry wall alone installatoin! Magnetic bubblelevel makes leveling work easy and convenient This level can be easily stuckto the wall plate and free your hands for other mounting work, making levelingwork easy and convenient. Includes all necessary mounting hardware This mountships with hardware for both wall and TV mounting. RoHS certified This productis RoHS certified, RoHS is the European Union directive standard ofRestriction of Hazardous Substance, aiming to protect human health andenvironment.